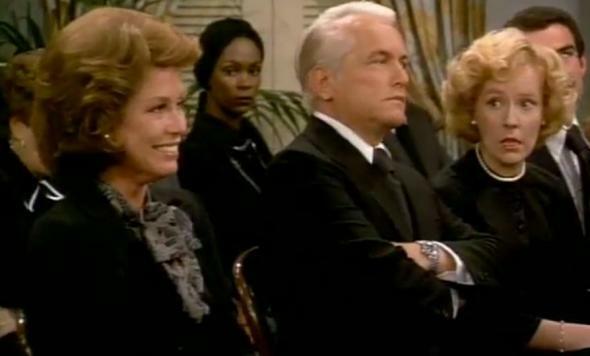 The funniest episode of the Mary Tyler Moore Show is a brilliant rumination on death and mourning. Mary Tyler Moore could turn the world on with her smile, but perhaps the greatest episode of the Mary Tyler Moore Show found her fighting a losing battle to keep that smile from spreading across her face. In “Chuckles Bites the Dust,” the team from the WJM newsroom—where Moore’s Mary Richards works as a news producer—confronts the demise of the station’s in-house clown, Chuckles, who entertained Minneapolis children in various guises: Mr. Fee Fi Fo, Aunt You Who, Billy Banana, and, fatefully, Peter Peanut. It’s a natural episode to revisit in the wake of Moore’s death—because its subject is mortality and mourning but also because it showcases what made Richards so irresistible throughout her long career. That busts everyone up all over again—everyone but Mary. She sees no humor in Chuckles’ untimely death and chides her colleagues for their callousness. The episode culminates with Chuckles’ funeral. Right up until the moment the priest begins his eulogy, Lou and Murray continue with their crude jokes, and Mary continues reproaching them. When the eulogy begins, however, everyone finally musters the appropriate seriousness for the occasion—everyone, that is, but Mary. The ridiculousness of the trampled clown’s death finally gets to her. It happens gradually, and Moore plays it perfectly. As the priest pays homage to the antics of Aunt You Who—“my personal favorite”—she lets loose a muted hoot, attempting to disguise it as a sneeze. When he finds in the resilience of Mr. Fee Fi Fo a model for all mankind, she struggles miserably to stifle a belly laugh. When he praises the life-affirming wisdom of Chuckles’ catchphrase—“a little song, a little dance, a little seltzer down your pants”—she flat-out loses it. For the majority of this most-famous scene from one of television’s most famous episodes, Moore doesn’t have a single line. The comedy comes entirely from her contortions in a folding funeral home chair, from the vain attempts to keep her laughter at bay, which play out at the corners of her mouth and the in the lines of her brow. Watch the scene yourself, and see if you are any more successful at keeping your emotions in check. In the wake of Moore’s death, it’s perhaps a dark moment to recall, but I would argue there’s no better way to remember her talent. She’s in her finest form here, madcap and masterful. And for those of us who loved her work, the message of Chuckles’ eulogist is a solace, too. Finally thrown off by Mary’s laughter, the priest asks her to stand up. Certain he’s about to rebuke her for giggling, she rises sheepishly, ready for a blow. Instead, the priest applauds her for her bravery and for recognizing that laughter is what Chuckles would have wanted at his funeral. He was, after all, a man who had lived to bring his audience joy. “Tears were offensive to him, deeply offensive,” says the priest. “So go ahead my dear, laugh!” At which point, of course, Mary breaks out into sobs. And the viewer beams.